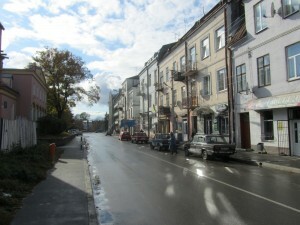 Uncertain skies over Shevchenko Street in Rohatyn. Photo © 2011 Jay Osborn. Yesterday Jay and I visited Rohatyn. This was our first trip back since having left Lviv in mid-June. There is much to report. To begin, I would like to express our heartfelt thanks to group member Alex Denysenko (and his driver Vitaly) who once again accompanied us and served as translator. There were some difficult moments on this visit, that I will discuss below, which could not have been resolved satisfactory had it not been for Alex’s presence and active and tactful advocacy on behalf of our group at some awkward, critical junctures. I also want to thank Abe Lyons, an American Peace Corps volunteer who is installed in Rohatyn through 2012. With the summertime departure of Ihor Klishch from Rohatyn’s library, I had been very concerned that our group lost an irreplaceable contact point in the town, as well as an intelligent and sympathetic friend. This was our first meeting with Abe, and he not only capably coordinated and organized times and places with those in town we wanted to meet with, but he accompanied us for most of the day, which, I might add, was cold, wet, and muddy. Although Abe is not Jewish, he is young and eager to learn more about our group and our projects in Rohatyn – past and future – and willing to help where he can. Abe speaks Ukrainian and appears to be very well liked in the community, especially among the young people and students. I believe he will be a valuable resource for anyone traveling to Rohatyn before his Peace Corps tenure expires. You can learn more about Abe and his projects for the Peace Corps in Rohatyn and in Ukraine, as well as contact info, on his Facebook page “Abram Lyons”. Yesterday’s visit was an ambitious one, in part because four months had passed since our last, and in part because we aimed to do it all in a single day without sleeping over, as we have on some prior trips. Regrettably, the weather was quite wintry at times and Jay and I both have bad colds. We left Lviv at 8 a.m. and returned at 10 p.m. I will discuss what we accomplished (or did not accomplish) by topic, as follows. Links to the photos we shot yesterday are given at the bottom of this report. 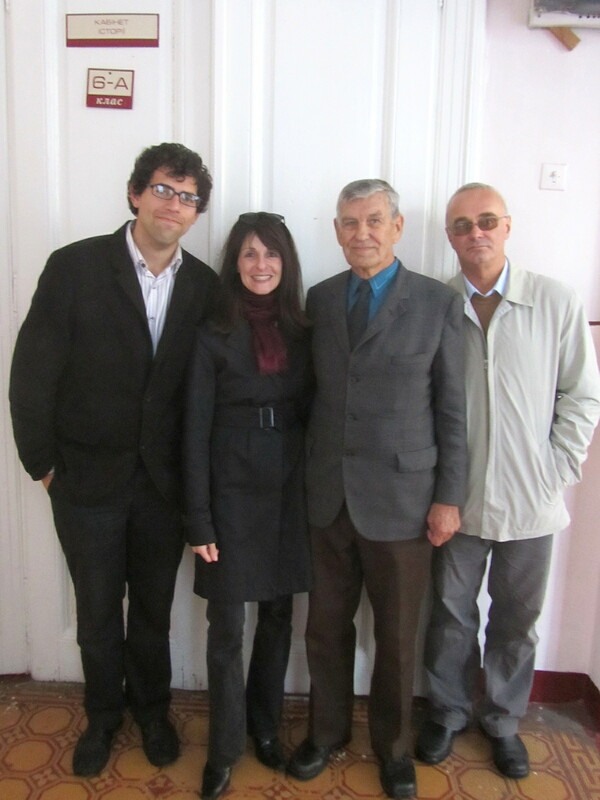 With Mr. Vorobets outside his classroom at the Red School. Photo © 2011 Jay Osborn. About 2 weeks ago, Alex D. received a letter from Mr. Vorobets giving an update on Jewish headstones recently returned to the “new” Jewish cemetery. 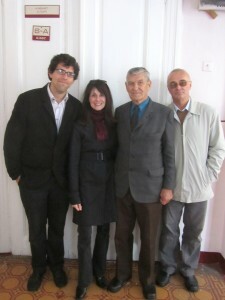 You will recall from prior reports to the group, that Alex graciously agreed to act as liaison between us/our group and Mr. Vorobets and it was pre-arranged that whenever Mr. Vorobets needed to communicate anything, he would write to Alex here in Lviv (as Mr. Vorobets has no telephone). This recent letter, among other things, detailed the moving since June of three more headstones (two headstones that had been previously found and photographed on one of our prior trips, plus one discovered in September), plus gave an accounting of the monies spent to accomplish their removal and transportation. We joined Mr. Vorobets, Alex D., and Abe in one of the reading rooms of the Rohatyn library (pre-arranged by Abe). 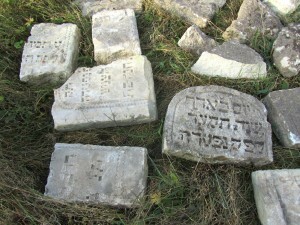 Mr. Vorobets explained that, since the letter, several more Jewish headstones had been found. He also explained that the identifying of some of the headstones was the product of the speech given by the local Ukrainian Priest to his parish explaining our group’s project (covered in one of my prior reports). In summary, since May, over a dozen additional headstones have been found by or reported to Mr. Vorobets. Some of these new headstones were found in the Zavoda (“across the river”) area at the west of Rohatyn, others in the former Babince neighborhood in eastern Rohatyn. Of the original $500 we left behind with Mr. Vorobets in May, $225 has been spent to-date for the removal and/or transportation of these headstones (and others found before May; in excess of 30 pieces total) to the cemetery. Yesterday we added an additional $250 to this fund (the residual balance now making $525), which, given what transpired later in the day (discussed below) we believe is likely to be exhausted in 2012. We were once again impressed with the solemnity and seriousness with which Mr. Vorobets views his role in this important project, and I want to again express the complete confidence we have in his trustworthiness and accuracy in reporting how the fund gets spent. 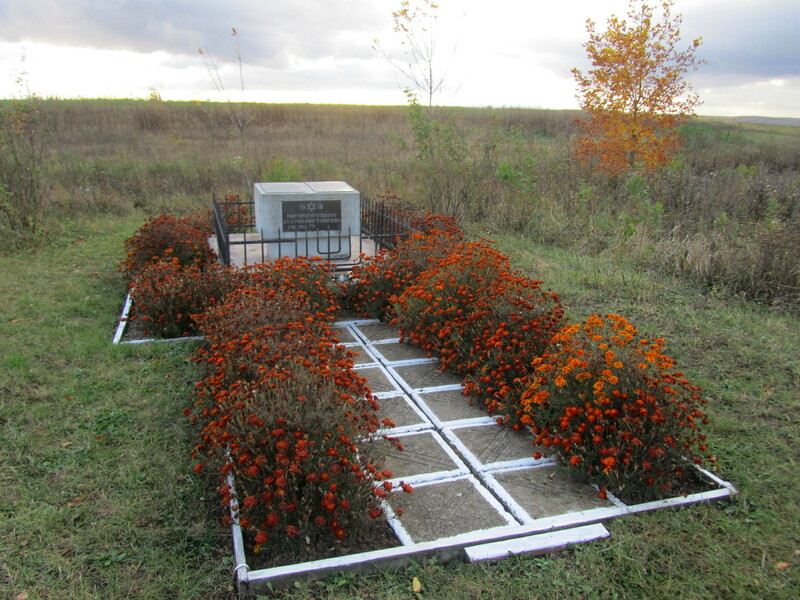 I hope everyone recognizes, as we do, that without Mr. Vorobets, the existence and location of these headstones – these sad, forgotten reminders of a despicable period for our families and for our town 70 years ago – would remain unknown to all us. Mr. Vorobets remained with us for the entire day, despite the weather and a sore throat he, too, was fighting. Abe, Alex, and Marla with the Deputy Mayor. Photo © 2011 Jay Osborn. 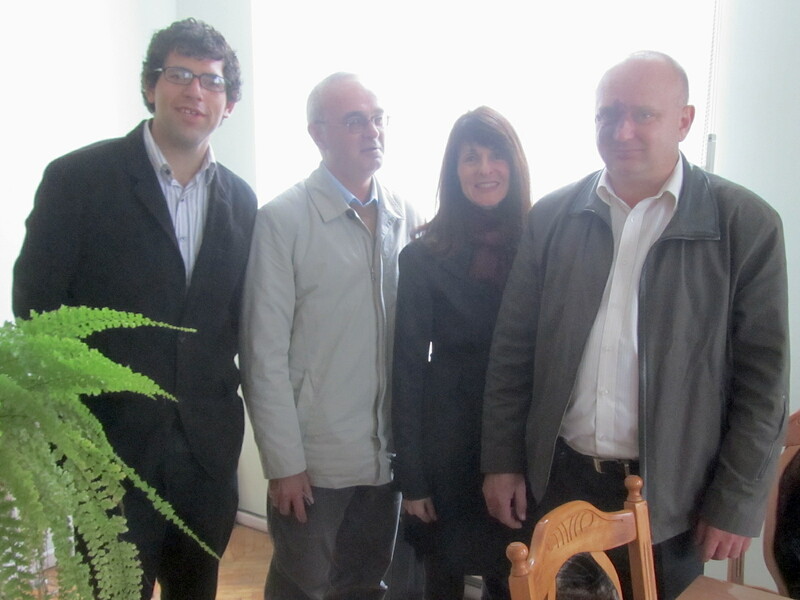 The Mayor was out of town, but we met with his Deputy, as well as the head of the department of public works (who had also been present at our prior with the Mayor during Alex Feller’s May visit). Mr. Vorobets, Alex, D., and Abe were present, as well. I was asked to say a few words on the background of our group and the headstone project, with Alex D., acting as translator. Mr. Vorobets added two points on this topic: one, that several streets in town were undergoing sewer and underground repairs and were uncovering headstones fragments during excavation; and second, that in the next few weeks, weather permitting, excavation was to begin on the private vegetable garden (located near the library on Ivano Frank street) with the intention of removing the several large Jewish headstones (rumored to be fully intact) known to be buried there. This latter project is expected to pose the most difficult challenges of removal and transportation to-date because of the size and weight of these stones. The Deputy Mayor took notes and asked several pertinent questions (see last topic, below, on the future goals of the headstone project). We shot a few photos with the Deputy Mayor. 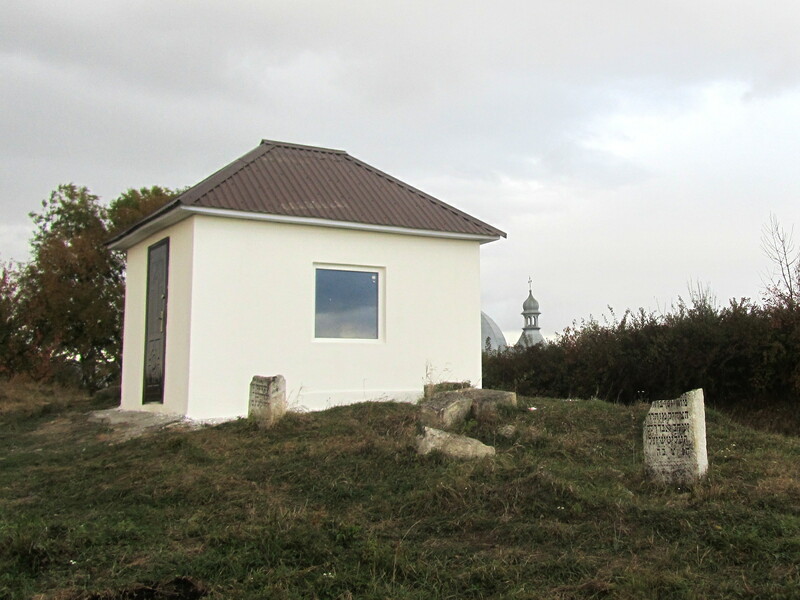 He then joined us to visit the synagogue ruins (which he arranged with the current owner of the abandoned building) and the headstones in town not yet been moved by Mr. Vorobets. On the excellent suggestion a few days ago of Alex Feller, we asked Abe to please see if arrangements could be made for us to be admitted to the ruins of the synagogue (located behind Halitskya, near Walova Street where 3 or 4 other synagogues also once stood). The site is today gated and locked. Although the exterior of the building has been the subject of many photos taken in the past by us, Alex, and others who have visited the town, no one has been able to get inside. The Deputy Mayor made a few phone calls and within 10 minutes we were met at the site by two men and let in. No doubt many of you have seen the old postcard photos of this building on the Rohatyn group site. The building was heavily damaged in both WWI and WWII, and the area around it devastated. After WWII, the roof and ceiling was rebuilt, and the building was used as a bakery. Inside today, there is a large cavernous space with several smaller rooms (added after the War) extending off the main room. In the entrance foyer is a staircase leading to what was once the women’s section, located upstairs. We did not gain access to the upstairs, but shot many photos of the ground floor rooms. As you will see in the photos, the once-arched windows are altered; no traces remain inside of the building’s former incarnation as a Jewish religious building. Nonetheless, we are grateful for the opportunity to have gotten inside and been able to document what it looks like today. Outside and inside the former synagogue on Valova Street. Photos © 2011 Jay Osborn. At our request, Abe and Mr. Vorobets arranged for us to meet again with the Director of the boarding school (located in the former ghetto area where the Judenrat building had also been located) who, on a prior visit, unexpectedly came forward with a box containing tattered scraps of miscellaneous pieces of paper of Jewish significance; these scraps had been found during the recent renovation of the school buildings, including the former Judenrat building, and appear to come specifically out of the Occupation period. (You can see the photos posted from this prior visit here: http://www.pbase.com/nuthatch/ua_110609_papers). At first, the Director seemed a little inconvenienced with our presence and further, that we again wanted to shoot more photos. Nonetheless, he made a small amount of room for us in his office to sift through the dusty, damp scraps. When the issue was raised whether we could take the whole box away with us for scanning and photographing, he seemed to get quite angry. We did not understand what had changed since during our last visit when he seemed somewhat willing to discuss up ahead the future of the box. It was all very confused and the environment got very strained. Mr. Vorobets tried to speak with him, as did Abe. However, it was due to the persistent and patient pleading of Alex D., that the Director finally calmed and realized that we all have the best intentions for the box; namely, the preservation, safekeeping, and recording of this important documentary evidence. Alex explained that the Director did not want “just anyone” taking the box away, and that he felt very strongly that these pieces of history would not even be here today had it not been for his voluntary efforts to collect them and preserve them – and this is absolutely true. Had it not been for this man’s foresight and personal intervention during the renovation of the buildings, these pieces would have been trashed and lost forever. We needed to find a solution (and a compromise) that would allow the box’s contents to be accessible and safe from further deterioration, but also respect and maintain its origins (i.e. where it was found and what it represents). The compromise, at present, is for the Director of the school to present the box to the Hesed-Arieh, the JDC-sponsored Jewish Museum here in Lviv run by Director Ada Dianova, who Alex D. knows. We will accompany Alex next week to meet with her. The plan would be for the school Director, on behalf of the City of Rohatyn, to present the box to the Museum, who will accept it and safeguard it. My hope is that anyone coming in the future to Rohatyn and Lviv can make arrangements in advance with the Museum to see the box firsthand should they so desire. I also hope to arrange to get all the contents scanned or photographed once it is with the Museum. I will keep the group apprised once I learn when the Director will be coming to Lviv. If this is scheduled after we have left Ukraine on 10 November, Alex D., has agreed to be present on our group’s behalf for the turning over of the box to this Museum here in Lviv. As a token of our appreciation to the boarding school and its Director, we left $100 with Abe, who has agreed to purchase in town at Christmas small stocking stuffers for the 170 children at the school, on our group’s behalf. Samples from the box of paper scraps. Photos © 2011 Jay Osborn. 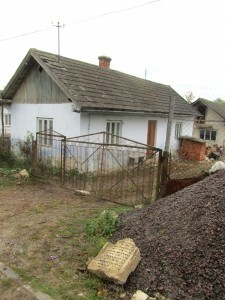 The new collection of stones on Yuri Rohatyn Street. Photos © 2011 Jay Osborn. Accompanied by the Deputy Mayor, Alex D., and Abe, and guided by Mr. Vorobets, we drove us to see the headstones discovered within the last few weeks, which have not yet been moved to the cemetery. 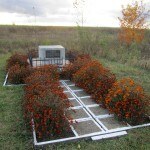 These were located out toward Babince where many headstones to-date have been found and moved. Once there, we walked along two roads, both of which were in the early stages of excavation for future sewer and water pipe replacement work by the City. On the first road (vul. Zelena, where there were already many stones found), Mr. Vorobets learned that some headstone fragments had been discovered when the earth was opened but had then been re-buried. We could see where these trenches were located, and although we did do any digging ourselves, Mr. Vorobets promised to get help to try to flip over a few potential candidates that were still visible to see if they were, in fact, headstones. A lone matzevah on Yuri Rohatyn Street. Photo © 2011 Jay Osborn. On the second street nearby (Yuri Rohatynsiv), the headstones that had been unearthed in the last few weeks during road excavations (about half a dozen or so) were visible and grouped together awaiting removal to the cemetery. Farther along that road, one headstone proved to be especially rich in deeply etched Hebrew script; it should prove easy to translate. 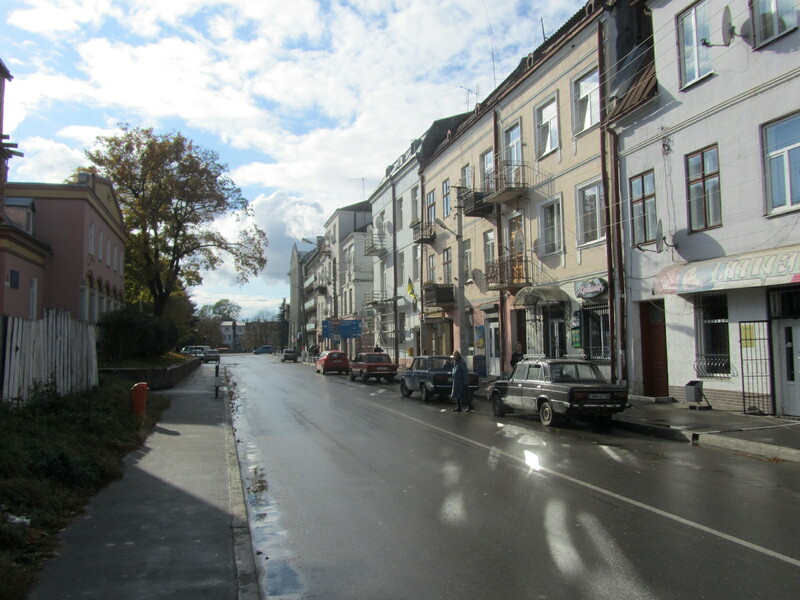 The Deputy Mayor explained that the entire length of both residential roads are scheduled to be opened for work over the next year; Mr. Vorobets added that both roads had been paved with headstones by the Nazis. Everyone understood that the next year’s work may produce headstones in numbers unimagined when this project began. The Deputy Mayor, Mr. Vorobets, and Alex D., stopped along the walk to speak with curious residents and townspeople who appeared in their gardens and on the road. I was very happy to have the Deputy Mayor with us during this part of our visit. I think he got a very good understanding of the magnitude of the project, the potential logistical problems, and our sincere commitment. At the garden on Ivan Franko with the Deputy Mayor. Photo © 2011 Jay Osborn. As for the large headstones awaiting removal from the vegetable garden near the Rohatyn library (discussed above), Abe has promised to shoot photos of the process once it has begun – we emphasized the desire to see photos not only of the headstones once out of the ground and at the cemetery, but also while being uncovered in the garden itself (in situ), if possible. 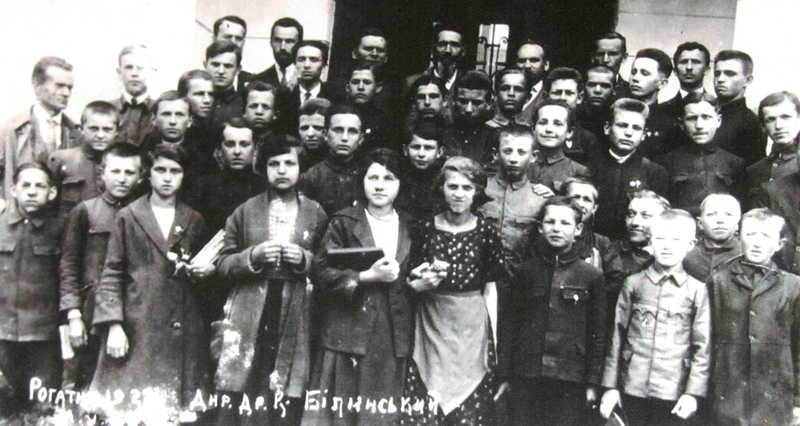 Finally, the most emotional part of the day came for me when Mr. Vorobets directed us back to the large paved inner courtyard near the Library where, during the War, the Gestapo headquarters had been situated. On numerous prior visits we had been back to this dilapidated, dusty place where, on an earlier visit, a few headstones had been found and moved. I knew from Mr. Vorobets’ earlier accounts that this courtyard had once been fully paved over with headstones. I knew that there would be more there, and for this reason, have suspiciously eyed the overgrown areas, rubbish heaps, and stone stacked walls along a portion of the space for clues. Indeed, the vegetable garden – awaiting excavation – is abuts one side of this infamous locale. Standing yet again before this sun-bleached white, stone-stacked crumbling wall, Mr. Vorobets boldly extended a hand and dislodged, without much effort, a stone. It fell to the ground. On the underside were well-preserved, easy discernible Hebrew letters. The Deputy Mayor stared on and himself pulled out another cut stone. Same result. And another. We stopped when it appeared we were undermining the small stuccoed building atop the wall; and that the project was too big for our small group. We put the half dozen we dislodged into the back of Vitaly’s van and later brought them to the cemetery. Another big project for Mr. Vorobets to handle on our behalf. Again, I was glad to have the Deputy Mayor with us. I cried. 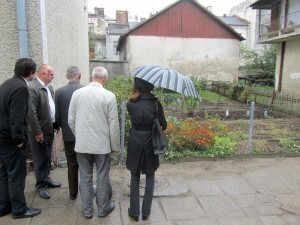 The foundation wall in the city center courtyard begins to yield Jewish headstones. Photos © 2011 Jay Osborn. Students and teachers of the Rohatyn gymnasium, 1922. Led by Mr. Vorobets, and accompanied by Abe and Alex D., we got a delightful tour of the grounds and interior of these two prominent and historic institutions. It was personally moving for me to walk the halls of the large building associated with the Ukrainian Gymnasium which was built in 1912 (the smaller, attached original building was built in 1909) where my Jute HORN and her younger sister Toncia (Tonka) HORN attended school years 1912-13. The inside of the Red School, formerly Polish (with Polish lettering [Szkoła Męska, Men’s School] still visible on the exterior front of this lovely brick building!) was especially lovely and original architecturally. In both schools, our presence attracted the smiling faces of curious of pupils! After, Abe led us inside a second, smaller building associated with the Ukrainian gymnasium (located on Shevchenko Street, next door to the Mayor’s office). In the inner foyer was an informative presentation with photos of the history of the Ukrainian gymnasium and its professors dating from 1914 until the present. Left: the Ukrainian gymnasium; right: the Red School. Photos © 2011 Jay Osborn. 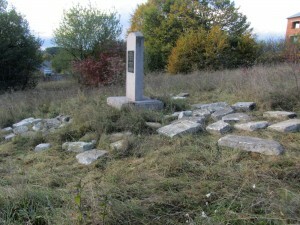 The southern mass grave memorial. Photo © 2011 Jay Osborn. Toward the end of the day we visited the southern memorial at the mass graves which is still in good condition and well tended by Mr. Vorobets. In the old Jewish cemetery. Photo © 2011 Jay Osborn. 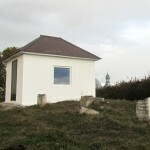 We also visited the “old” Jewish cemetery and were surprised to see a newly-constructed, white stucco small locked building [an ohel] built over the three cylindrical old graves located at the top of the hill. Alex D. asked a man who was clearing weeds on the grounds, who explained that earlier that same day, a group of Hassids from the Ukrainian town of Uman had finished its construction. We have no other information at this time, including who they were and who now has the key to the locked door to these graves. Lastly, I would like everyone to give thought about the future and what we envision for our ongoing projects and our town. At the top of the list, in my opinion is the headstone project, as this project is likely to continue for many years. The growing collection of headstones in the new cemetery. Photo © 2011 Jay Osborn. I know that some of you have experience in other groups with similar headstone projects, and I am hoping that you will openly share your ideas and suggestions on what to do with the headstones, fragments, and pieces brought to the “new” cemetery. At present, and appropriately so, the focus is and has been on getting them out of the walls, streets, sewers, gardens, and foundations where they have been at risk for the last 70 years, and brought for safekeeping, photographing, and translating, where possible, within the fenced confines of the cemetery. So far, upon arrival they are laid down, randomly, concentrated mostly around the 1998 memorial. A few are located in other places closer to the entrance. However, there are hundreds of headstones and partial headstones – brought before we ever arrived to Rohatyn and started this project – hidden face down and face up behind the wall of overgrown shrubs scattered among the 3 or 4 complete headstones still standing. One idea would be to formally place them along a concrete or stone footpath leading to the memorial, as I have heard done by other Jewish groups with similar projects. Then there are the practical questions: How would that look? How would that be paid for? How would that be organized and by whom? Should a rabbi be present? Should there be a formal ceremony, as in 1998, with Rohatyn also dignitaries present and religious leaders from the region? A small sample of the recovered headstones. Photo © 2011 Jay Osborn. Our long-term plans for the headstones was specifically raised during our meeting yesterday with the Deputy Mayor. My response was honest – I did not know. The question is important and I think we should start now sharing ideas. We have undertaken a big responsibility with this project, not only to the memory of our families, but also to the town and to those who have been and will continue to help us. Finally, to those of you with children and grandchildren, please educate and interest them now, so that someday, they can carry on with what we – and those that preceded us – began as a project of love. You can download any of these at full or smaller resolution by clicking on the individual image.